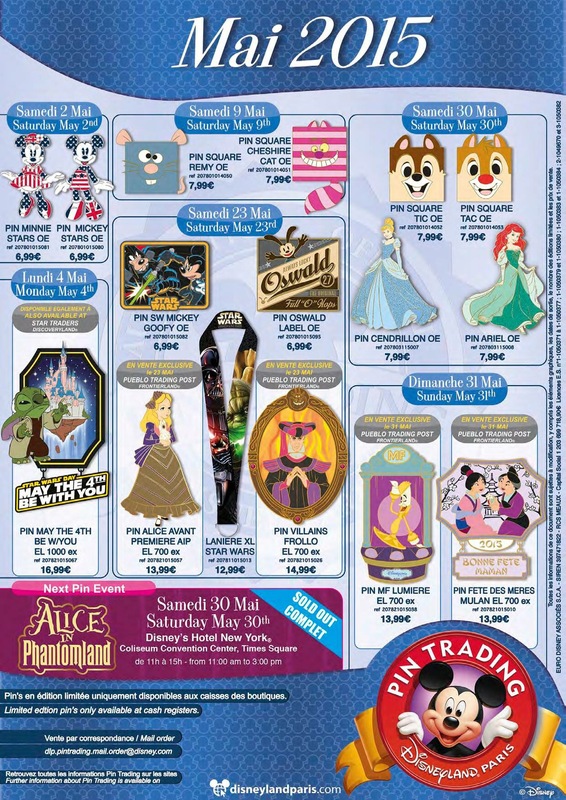 There is a nice selection of trading pins being released at Disneyland Paris in May. There is no new attraction pin next month but the two Star Wars pins look nice, especially the Stitch ‘May The 4th Be With You’. I can see this one becoming quite collectable in the future. The new character Square pins are quite cute too. Finally next months Pin Trading Event on the 30 May at Hotel New York is sold out. 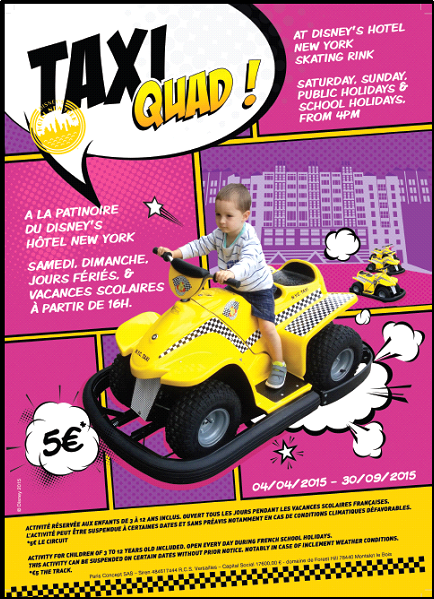 The electrical Taxi Quads have made a return to the rink at Hotel New York until 30 September 2015 inclusive. The Taxi Quads are open to children from 3 to 12 years and the price is 5 € / a circuit. They will operate from 4:00 PM to 10:00 PM on Saturdays, Sundays and public holidays, and then daily during the school holidays. This activity is subject to weather conditions and may be suspended without notice. 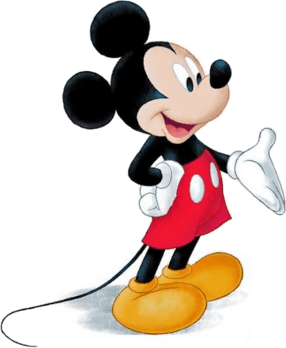 Receive a magical telephone call from Mickey Mouse! If you’re traveling to Disneyland Paris soon and are looking for a way to entertain your children or loved ones before you go. Then why not book a telephone call from Mickey Mouse himself to surprise them. Just visit www.dlpmickeycall.co.uk and enter a convenient date and time for Mickey Mouse to call you. Here is a Disneyland Paris refurbishment update collated by Cafe Fantasia using information tweeted from lnsideDLParis and DisneylandBerry. 13 April 2015 – Captain Eo closed it’s doors for the final time. Source: Cafe Fantasia, lnsideDLParis and DisneylandBerry. Disneyland Paris have released further details on the new PhotoPass+ service for annual pass holders. The new service will launch on the 4 May 2015, and the pass will be valid for one year from the date of activation. The good news for annual pass holders is that they will receive an introductory discount of 10€ off when they purchase the annual PhotoPass+ between 4 May to 3 July. Cafe Mickey are reporting that from the 4 May 2015, Disneyland Paris will launch an annual Disney PhotoPass+ for Annual Passholders which will allow multiple use for a whole year. 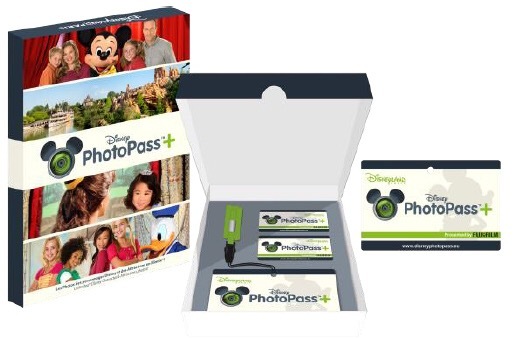 Presently once activated PhotoPass+ lasts for 10 days and costs 49.99€. The good news for annual pass holders is that they will receive an introductory discount on the new annual photo pass of 10€ between 4 May to 3 July. The annual PhotoPass+ for Dream annual pass holders will cost 39.99€ and 44.99€ for Fantasy and Francilian annual pass holders. It’s always interesting to know the share ownership statistics of Disneyland Paris, so here is the latest breakdown for Euro Disney S.C.A. as of the 20 April 2015. The major thing that jumps out at you is that The Walt Disney Company now own over 77% of Disneyland Paris. Many thanks to Edith from APPAED (Association des Petits Porteurs d’Actions EuroDisney) for this very interesting data.